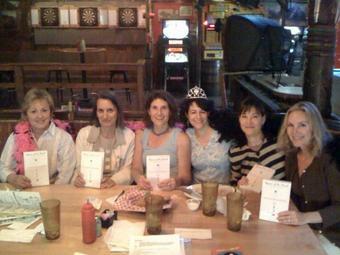 Last night my very own, fabulous book group (the one I've been in for over a decade) did QUEEN OF THE ROAD off galley copies. Thanks, ladies! Don't wait - live your dreams NOW. Keep challenging and stretching yourself. The most important thing is to spend time with the people you love. Jane Ann has worked with Tim. Last night, she had to answer the question: "Is he really as great as Doreen portrays him?" (Hmmm. Wait'll I do that next edition.) Answer: "Yes." (There's that whole onion ring thing, again.) But then, she added, "And, what's really great, is you can tell how much he loves Doreen." Made even my cold, shrivelled heart melt. Thanks, Jane Ann. Sheryl, I term my "insane" friend, because her dream is to hike the Appalachian trail - 'nough said. Dina, who has had a fascinating life, providing aid in destitute, war-torn areas around the globe, had been in our group years before, then left to do her good work. She came back only recently and we're selfishly thrilled to have her with us, again. PS - Mom. I know you're going to be royally P.O. 'd as only a Queen Mother can, that all these ladies have read the book and you have not. But, I wanted you to read the real book (you know, not a typo-filled, mistake-ridden, no blurbs yet galley copy) and I only got those last week. Yes, I know, I haven't sent you one of those, either. And, yes, I know in desperation, you ended up ordering one on Amazon. I'll be happy to sign it for you. That's a very nice tribute to the people who have helped you along the way!! They look like a fun group! One of the reasons I want to get published is so I can have a page of thank-yous to all the people who have read and critiqued my writing. Maybe many pages.....Do publishers limit you on this sort of thing? My publisher didn't edit my acknowledgements at all - maybe because she knew I'd been working out. What a great group of women. You're so lucky to have them so close that you can get together in person too. And is that a black cat on your shoulder? Or is your hair suddenly very long? Always wanted a "shoulder cat", but alas, that's a black boa. Just for that, I hereby decree you shall sing your QUEEN OF THE ROAD song at my launch party. I'm impressed re. the fact that it's in second printing already without being released. Definitely a good sign, Doreen. Do let me know if/when your book tour takes you to the northern climes of Canada, specifically Toronto. Ah...the power of Internet..."talking" to your mom via your blog. Love it! fugedaboudit!! As punishment, Queen Mother declares that you may bring only one pair of shoes when you come to visit. However, Tim, my wonderful, witty and charming son-in-law may bring as many as he wishes. This page contains a single entry from the blog posted on May 21, 2008 12:14 PM. The previous post in this blog was Random Updates. The next post in this blog is Don't Put Off Your Dreams.